Chop the cauliflower into medium pieces. Heat a large skillet over high heat. Add the oil and heat until shiny. Place the cauliflower in the hot oil, stir to cover with oil, and place a lid on the skillet. Check skillet every few minutes to keep cauliflower from burning, but let it get a nice browned roasted outside. Continue to let cauliflower cook, covered, for about 10-15 minutes, or until tender-crisp. Let cool for a few minutes. Preheat the oven to 450. In a blender or large food processor, place eggs, cornmeal, and seasoning. Place cauliflower in blender and puree until you have a semi-smooth, thick batter. Cover a pizza pan with parchment paper and pour batter into the center of the paper. Spread until you have about a ½ inch thick crust or thinner if desired. While crust is cooking, coat chicken with barbecue sauce. 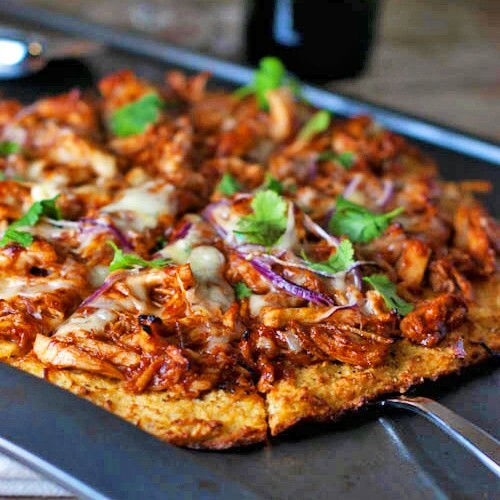 When the crust is cooked through and golden brown, remove and top with barbecue chicken, half the cheese, red onion, and the rest of the cheese. Bake for 10-15 minutes or until cheese is melted and golden. Top with cilantro, slice, and serve!